In addition to the three fewer employees at the fire station, the scenario is compounded with two current vacancies, one out recovering from an on the job injury and another out on paternity leave. 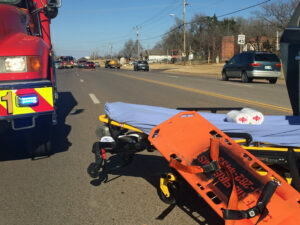 The department, whose primary EMS coverage area is within the Guthrie school district, responded to a record 3,002 calls last year, including 2,604 EMS incidents. Many of those calls came in all at once and forced other ambulance services outside of the area to assist GFD in answering those calls. “Pretty much, we’re leaving our city unprotected,” Guthrie fire Lt. Ryan Reeves said when firefighters are out on multiple calls. Reeves shared one example when the department responded to a house fire with only two firefighters because two ambulances were out on calls. “We are putting more and more pressure on the equipment and staff,” City Manager Leroy Alsup said in the 32 percent increase in EMS calls and 27 percent fire calls since 2008. Alsup told council members they will be adding an additional firefighter to help relieve some of the pressure and this relief firefighting will be assigned where needed within the department. The city manager reminded council members this was not a permanent fix, but will help until a more definite plan is finalized. So what about the revenue and the expenditures? In the fiscal year of 2016, ambulance fees ($711,884), EMS District I-1 ($350,410), EMS Ambulance and grants ($295,978) totaled $1,472,626. However, the department’s expenditures were $2,791,406. The majority of that cost came from the personnel category ($2,051,428) as well as materials, services, outlay and debt. The City was forced to fund the remaining balance ($1,183,515) from the City’s General Fund. In which, the fund has been needed several years to subsidized the department. In 2008, $712,883 was needed from the General Fund to aid the fire department. While not all of the expenditures were directly EMS-related, the lion’s share of fire department activity involves EMS. The department’s expenditures had grown 87 percent, or just under $1.3M from 2008 to 2016. The projected growth at the same rate shows approximately a $300,000 increase each year for the next five years. In which, with the current plan would continue to put stress on the City’s General Fund. Alsup said there is not one action item that will fix the issue, but will take a combination of actions. He says his office will take a look at a five-year budget and consider all options. Along with the school district primary coverage, the fire department currently responds to medical calls outside their boundaries despite not being subsidized for the services. 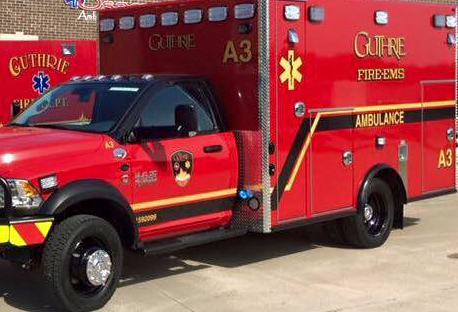 Homeowners in the Guthrie school district pay a maximum three mill property tax for ambulance service, while residents in Coyle, Langston, Meridian and Mulhall do not supplement the three mills, but receive ambulance services from Guthrie EMS. If the three mills were collected in those unsubsidized areas (roughly $106,000) the funding would not generate enough income to overcome the City’s shortfall. 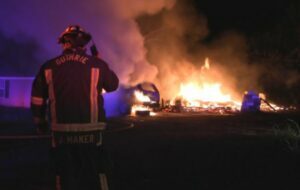 “The only thing we are going to gain is man hours and a little wear and tear on trucks for not going out there,” Guthrie Fire Chief Eric Harlow said if the city council elected not to cover EMS in those towns outside their boundary lines. Harlow reminded the council that the majority of the call volume is within the school district boundary lines. The Logan County Board of County Commissioners, spearheaded by District 1 Commissioner Marven Goodman, are considering options for EMS coverage if the City of Guthrie elected to discontinue service to those areas outside of the Guthrie School District.